Cancer Research UK and Marie Curie will both benefit from the event, held in the pools at the three Tendring District Council-run leisure centres, which is part of a national fundraising initiative. 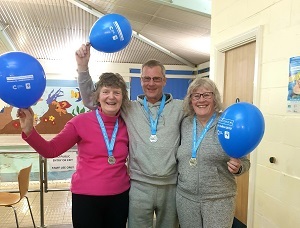 More than fifty people, some swimming as teams, took part in the swimathon across the three sites, each covering at least five kilometres – while some completed a ‘triple’ event of 15km. Mike Carran, Head of Sport and Leisure at Tendring District Council, congratulated everyone who took part. “Once again our leisure centre customers have outdone themselves in aid of charity, and I am sure the funds will be put to good use.